Although the Air Almanac contains astronomical amounts of data, most of it is devoted to tabulating the GHA of Aries and the GHA and Dec of the sun, moon, and the three navigational planets most favorably located for observation. Enter the daily pages with Greenwich date and GMT to extract the GHA and Dec of a celestial body. The GHA is listed for 10-minute intervals on each daily sheet. If the observation time is listed, read the GHA and Dec directly under the proper column opposite the time. For example, find the sun’s GHA and Dec at GMT 0540 on 11 August 1995. [Figure 8-10] The GHA is 263°–41′ and Dec is N 15°–24′. (Extractions of GHA and Dec are to the nearest whole minute.) To convert these values to the subpoint’s geographical coordinates, latitude is North 15°–24′. When GHA is greater than 180°, subtract it from 360° to get east longitude. The subpoint’s longitude in this example is (360°–00′ minus 263°–41′) East 96°–19′. Figure 8-11. Interpolation of Greenwich hour angle, Air Almanac. For example, on 11 August 1995, you observe the sun at 1012 GMT. Enter Figure 8-10 to find the GHA listed for 1010 (331°–1 1′). Since the observation was 2 minutes after the listed time, enter the Interpolation of GHA table and find the correction listed for 2 minutes of time (30′). [Figure 8-11] Add this correction to the listed GHA to determine the sun’s exact GHA at 1012 (331°–41′). The Dec for the same time is N 15°–21′. Thus, at the time of the observation, the subpoint of the sun is at latitude 15°–21′ N, longitude (360°–00′ minus 331°–41′) 028°–19′ E.
For example, at 0124 GMT on 11 August 1995, you observe Altair. 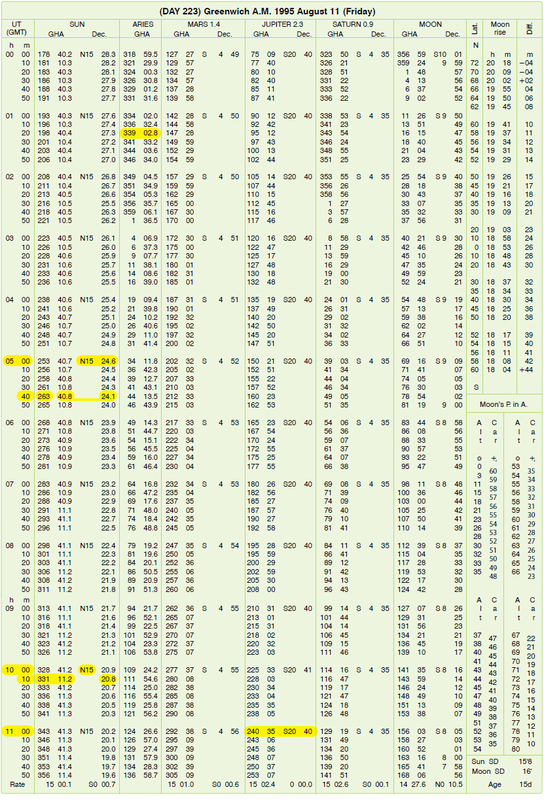 To find the GHA and Dec, look at the extracts from the tables in Figures 8-11 and 8-12. You can find the GHA and Dec of a planet in almost the same way as the sun. Because the planet’s Dec change slowly, they are recorded only at hourly intervals. Use the Dec listed for the entire hour. For example, to find the GHA and Dec of Jupiter at 1109 GMT, 11 August 1995, enter the correct daily page for the time of 1100 GMT. [Figure 8-10] The GHA is 240°–35′ and the Dec is S20°–40′. Enter the Interpolation of GHA table under sun, etc., to get the adjustment for 9 minutes of time, 2°–15′. [Figure 8-11] Therefore, GHA is 242°–50′. Jupiter’s subpoint is at latitude 20°–40′ S, longitude (360°–00′ minus 242° –50′) 1 17°–10′ E.
If you need to find an accurate GHA and Dec without the Air Almanac, you can find the procedures and applicable tables in Publication No. 249, Volume 1 for Aries or Volume 2 or 3 for the sun. The moon moves across the sky at a different rate than other celestial bodies. 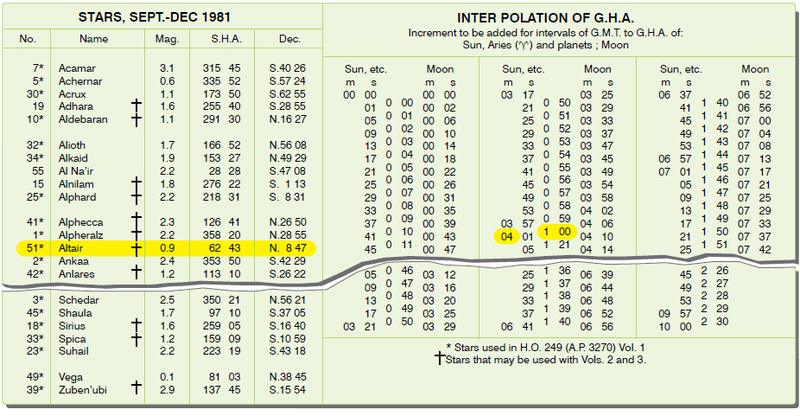 In the Interpolation of GHA table, the intervals for the moon are listed in the right column where the values for the sun, Aries, and the planets are in the left column. The interpolation of GHA table is a critical table and the increment is opposite the interval in which the difference of GMT occurs. 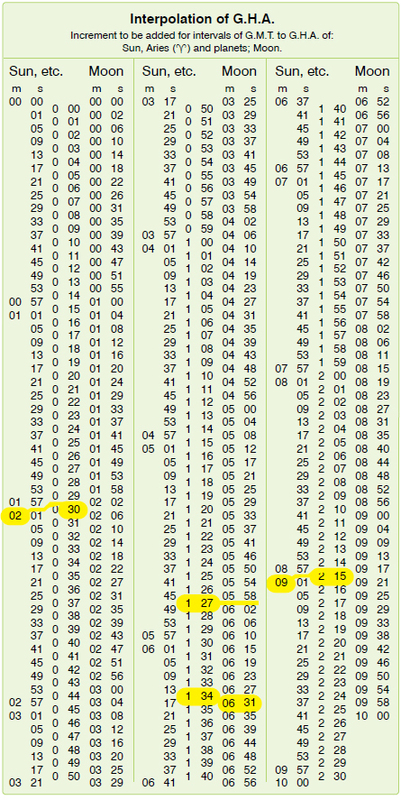 If the difference (for example, 06′-3 1″ for the moon) is an exact tabular value, take the upper, or right, of the two possible increments (that is, 1°–34′). The up, or right, rule applies to all critical tables. Thus, at 1136Z, the moon’s subpoint is located at S 8°–00′, longitude 164°–43’W. The stars and the first point of Aries remain fixed in their relative positions in space, so the gas of the stars and Aries change at the same rate. Rather than list the GHA and Dec of every star throughout the day, the Air Almanac lists the GHA of Aries at 10-minute intervals and gives the sidereal hour angle (SHA) of the stars. The GHA of a star for any time can be found by adding the GHA of Aries and the SHA of the star. The GHA of a star is used to precomp any star that falls within 29° (Dec) of the equator using Volume 2 or Volume 3. The table, STARS, is inside the front cover of the almanac and on the back of the star chart. This table lists navigational stars and the following information for each star: the number corresponding to the sky diagram in the back, the name, the magnitude or relative brightness, the SHA, the Dec, whether used in Publication No. 249, and stars that can be used with Dec tables. NOTE: If you need a higher degree of accuracy, the SHA and Dec of the stars are listed to tenths of a degree in the Air Almanac’s appendix. Thus, the subpoint of Altair is 08°–52′ N 042°–24′ W.
All the celestial concepts and assumptions you have learned may help you obtain a cestial LOP. A celestial LOP is simply a circle plotted with the center at the subpoint and a radius equal to the distance from the observer to the subpoint. To accurately compute this distance and the direction to the subpoint of the body, you must initially position the subpoint and then measure the angular displacement of the body above the horizon. GHA and Dec position the body, and the sextant measures the height above the horizon. A basic knowledge of celestial theory and LOPs will help you appreciate celestial navigation and detect errors. The next section explains how angular displacement is measured. You can get a copy of the Air Almanac Here.